A pleasant climb on mostly good rock, apart from a couple of shaky and exposed pinnacles. From the glacier, climb a steep rib on solid red greywacke. Bypass the lower section of the ridge by following a glacial lead and scrambling on to a small buttress, then follow straightforward rock on to the South West Ridge. From the upper Ramsay Glacier follow a glacial lead on the west face just north of the saddle between Pt 2230 metres and Pt 2286 metres. Climb this, then head south to join the South West Ridge. Follow the ridge, moving on to the face on the right to avoid a small gut of loose rock. Reach the ridge by crossing the toe of the South West Ridge at Pt 2230 metres, passing through a gap to the Lauper Stream face. 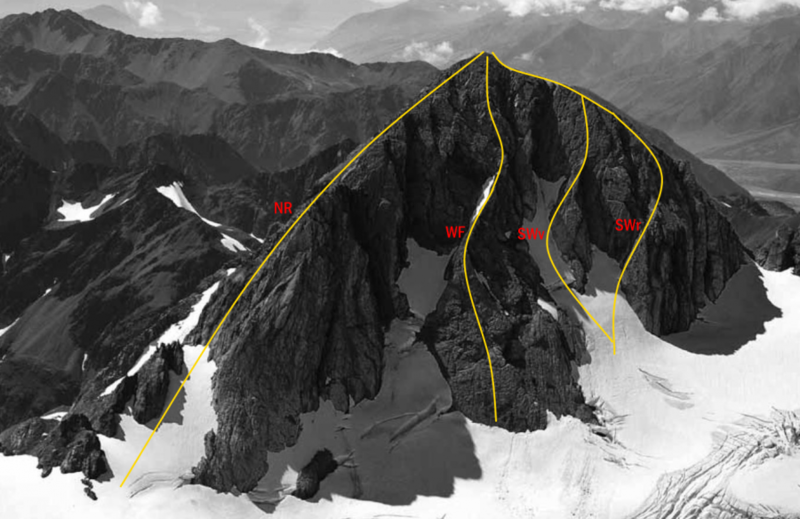 From here, cross the snow slope to join the South East Ridge, which offers good climbing to the summit. Gain scree slopes east of Whitcombe Pass and climb these to the loose rock ribs that lead directly to the East Ridge.